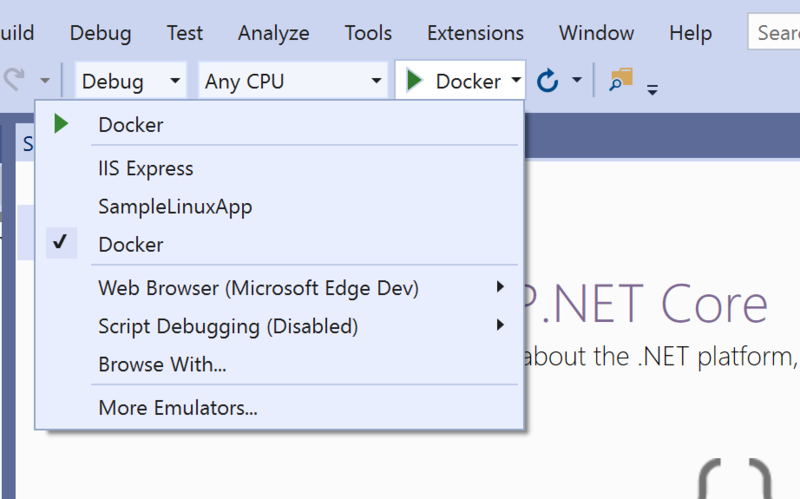 In my earlier post I covered creating and debugging an ASP.NET Core service using Docker Desktop. 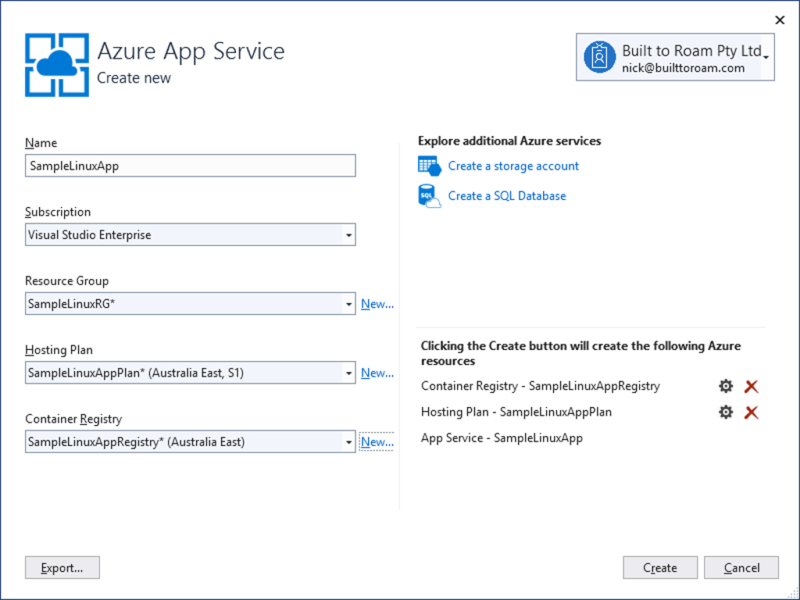 I’m going to build on that and look at how you then push the service into an Azure App Service. 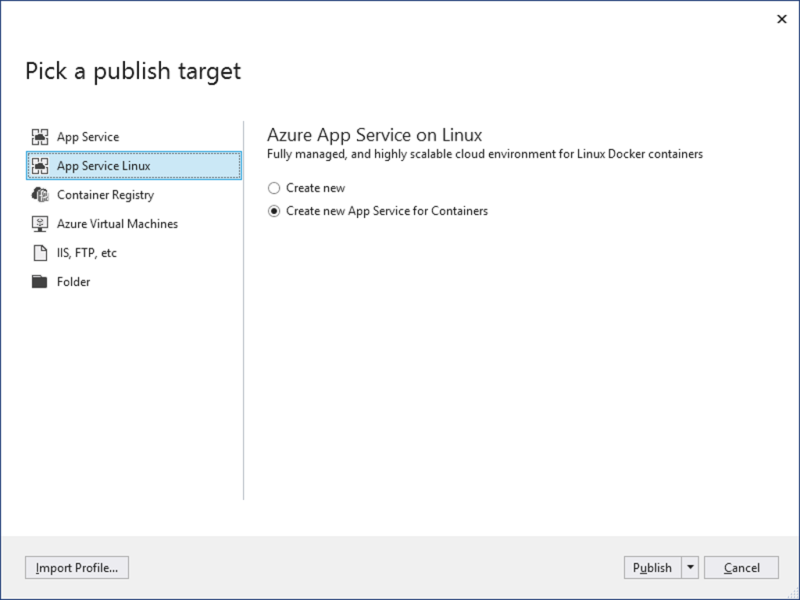 Normally I’d simply use the publish option that would allow me to push the service directly into an Azure App Service – this would run the service in much the same way as it runs locally if I was debugging on IISExpress. 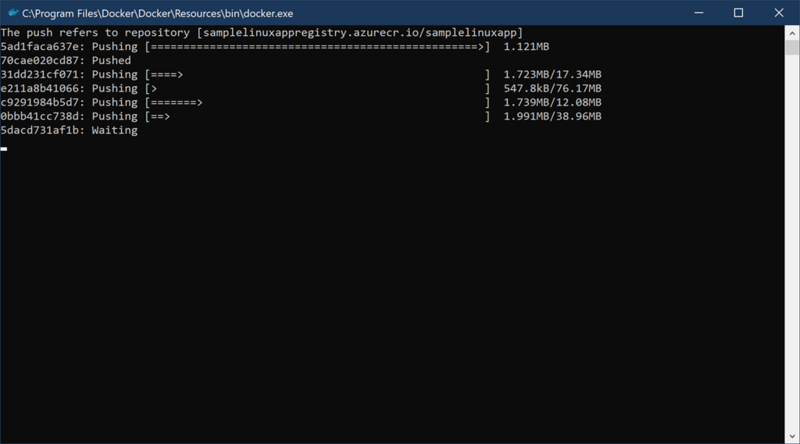 However, since I’m debugging via a docker container I figured it’d be great to push to Azure in a way that it continues to run in a container. 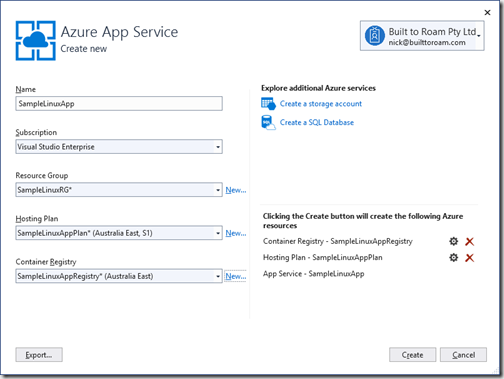 Actually the reason I explored this in the first place was that I’ve been experimenting with GRPC and currently this doesn’t seem to be able to be supported on a regular Azure App Service. I figured if I could run my code in a container there would be less restrictions so I would be able to get GRPC to work (this is work in progress still). What I did notice in Visual Studio is that when I right-clicked on my ASP.NET Core project and selected Publish, one of the options I saw was to Create new App Service for Containers. 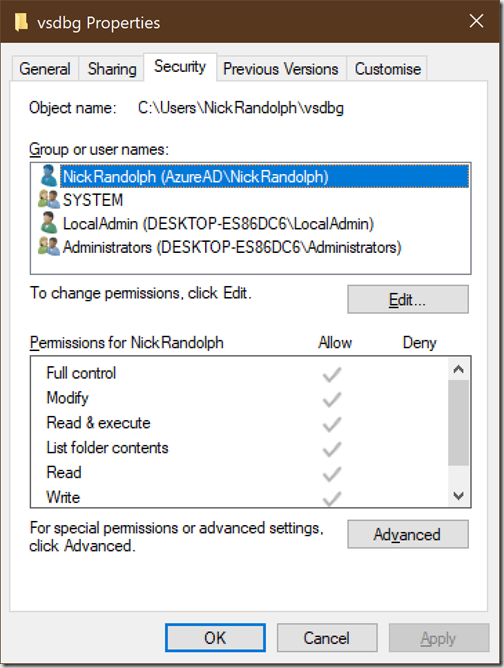 Clicking Publish started the wizard to allow me to create the appropriate resources in Azure. 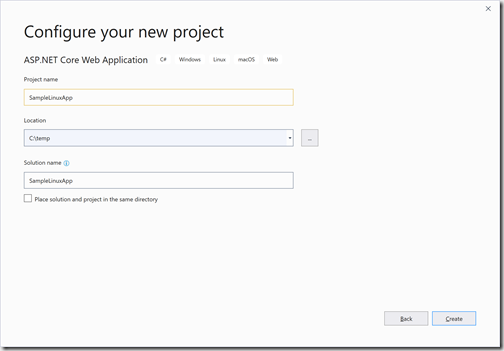 Clicking Create will trigger the creation of the selected Azure resources and then proceed to publish the application. Turns out I didn’t have Docker Desktop running (I have so many apps like Slack, Teams, Skype etc that run in background that I force quit most of them each day to try to retain some semblance of a reasonable battery life on my laptop). 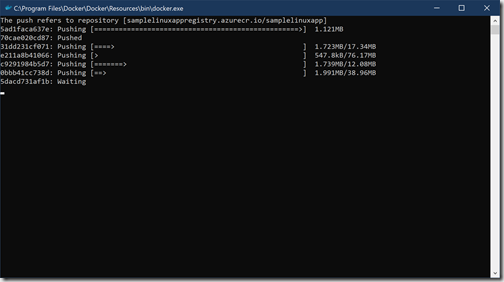 Once I realised that I needed to start Docker Desktop, the publish process kicked off and I saw the Docker deployment console appear with quite a detailed breakdown of the upload status – seriously why can’t Visual Studio’s build progress window be this useful. I really need to hand it to the Docker team as their uploading was super resilient. I started off uploading off our standard wifi connection which is based on an ADSL connection, so minimal upload bandwidth. I got impatient so switched mid-upload across to my mobile hotspot – after a second or two delay, the upload retried and continued without missing a beat. Once publishing has completed, the Azure App Service should be all setup and ready to go with your code already published. You can use the Site URL in the publish information pane to launch the service for testing. Since my application was a web api, I’ve appended the /api/values so that I get a valid response from the Get request. 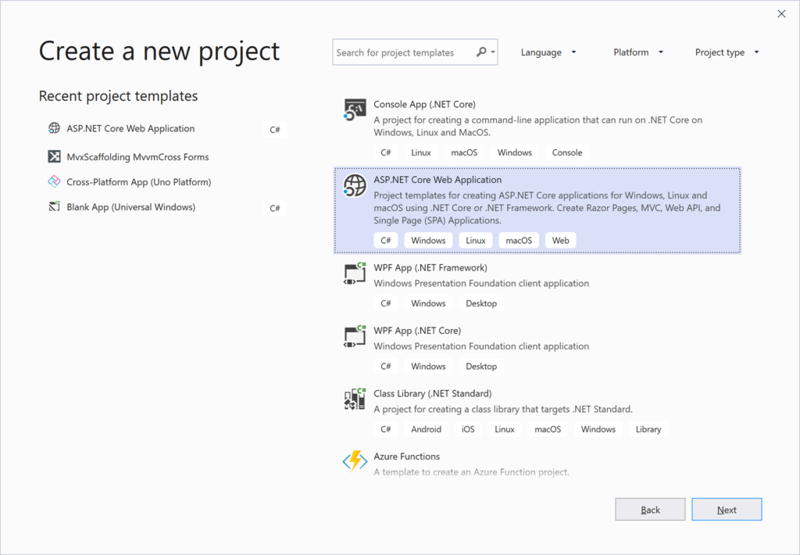 One of the thing that continue to amaze me about Visual Studio is the ability to create and publish new projects to Azure. Of course, for production apps, you wouldn’t follow this process at all but it does make spinning up end to end prototype applications a walk in the park. 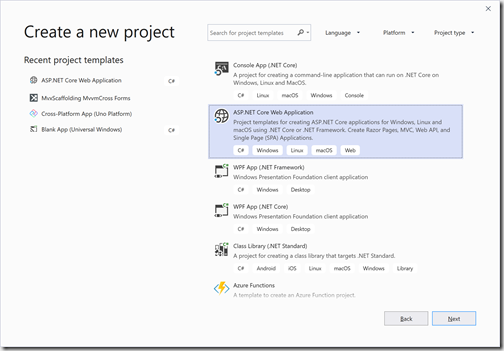 With Visual Studio 2019 hot off the press I’ve been experimenting with a few of the new project templates and the improvements that have been made in Visual Studio. 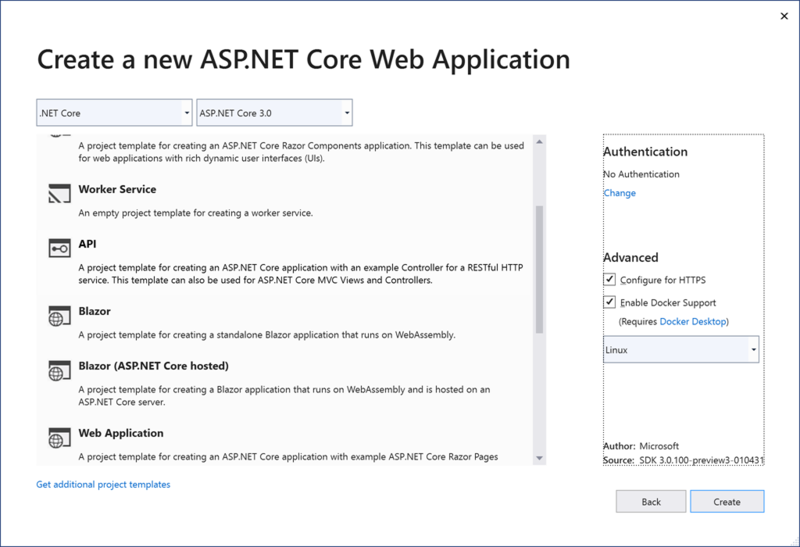 In this post I’m going to cover how to solve a particularly annoying problem I encountered when attempting to run and debug an ASP.NET Core 3 application from within Visual Studio, hosted within a Docker image. I’ll walk through the whole process of creating the new project and the issue I ran into when first attempting to debug the application. 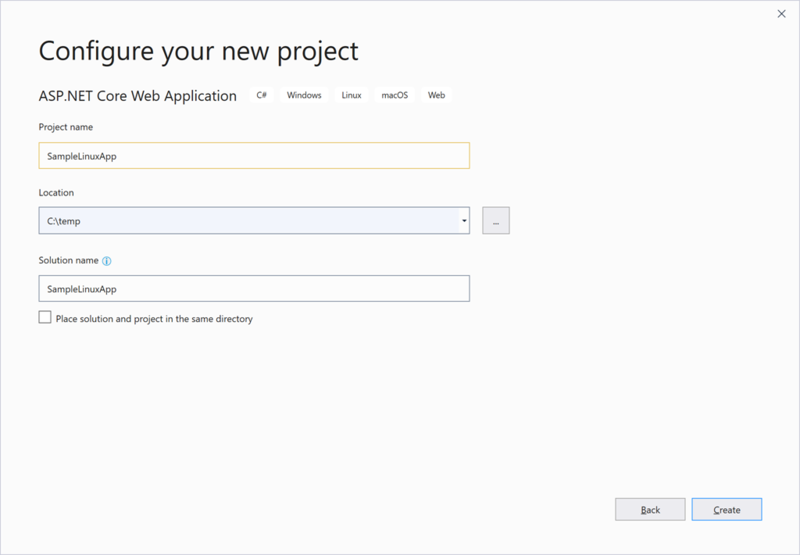 When you launch Visual Studio 2019, or go to create a new project, you’ll see the Create a new project dialog. 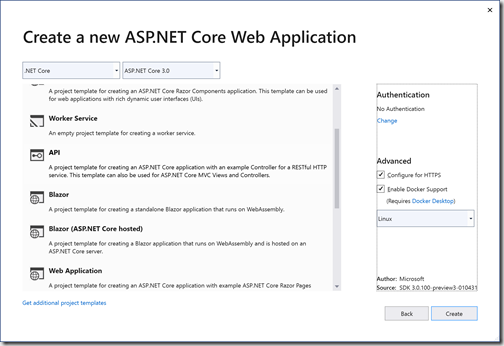 We’re going to select the ASP.NET Core Web Application template. Next we need to provide the standard project information such as name and location. The next stage is to provide more information about how the template should be configured. Here we’re selecting the API template from the left of the screen, and checking both the https and the Enable Docker Support. Note: At this point if you haven’t already downloaded and installed Docker Desktop, do it now. It’s a half Gb or so download, so not small, and may take a while based on your network bandwidth. After creating the template, you’ll see that there are a number of options available to us in order to run the application. We’re going to proceed with the Docker option. 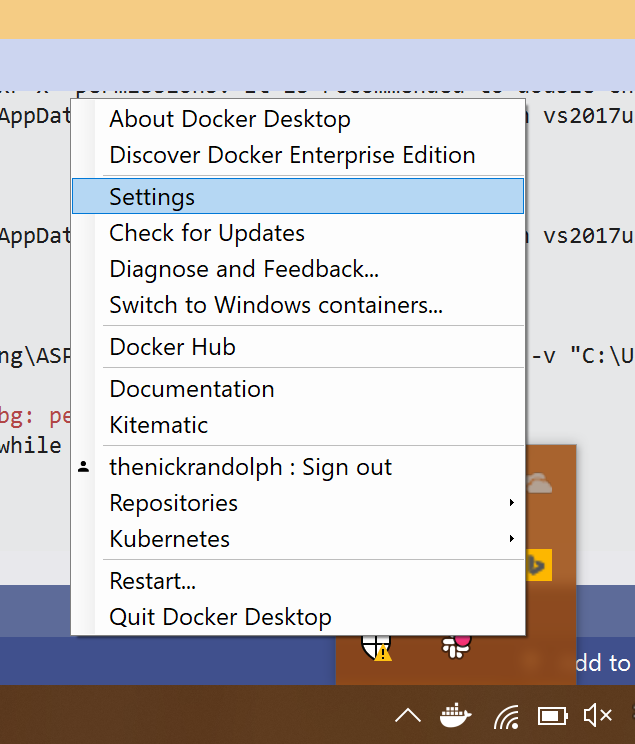 If you haven’t already, make sure you have launched Docker Desktop, otherwise you’ll see the following warning in Visual Studio when you attempt to run the application. 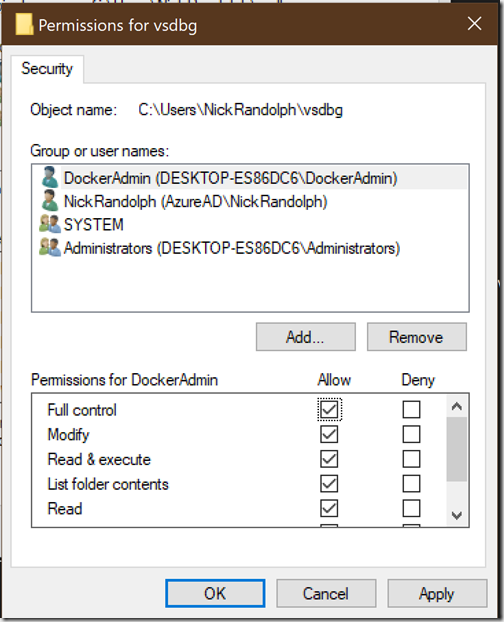 Unless you’ve previously setup Docker Desktop you’ll most likely see the following error. 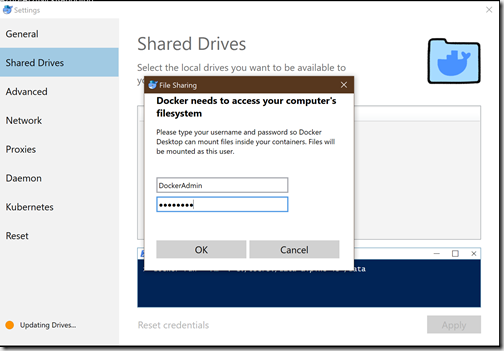 Essentially you need to award Docker Desktop access to a drive in order to create images etc. 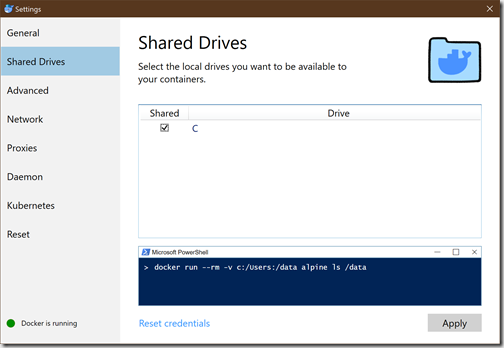 Under Shared Drives tab, check the local drives you want to make available to Docker Desktop. When you click Apply you’ll be prompt to authenticate. It will detect the credentials of the current user, which for me is an Azure Active Directory user. 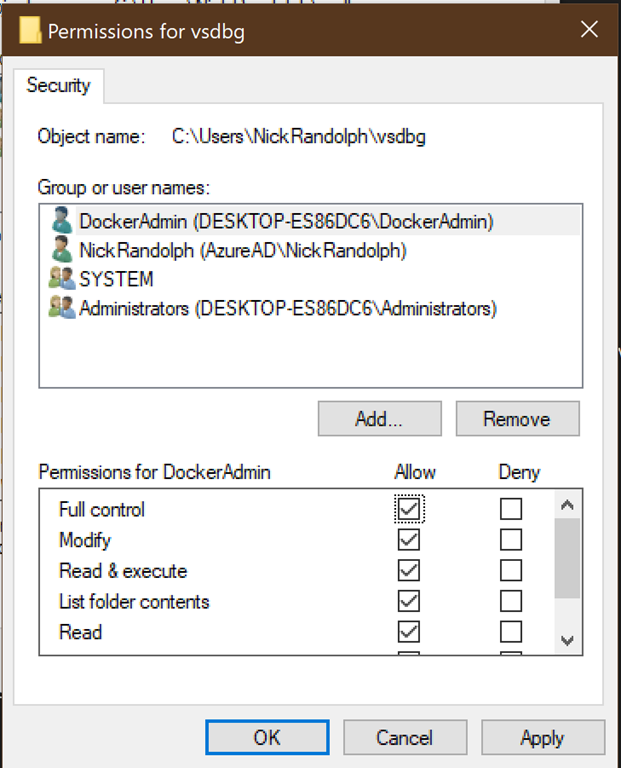 Important: Unfortunately after providing my password and clicking OK, Docker Desktop decides that it will uncheck the drive that I had selected. This seems to be a common issue, raised by a couple of different people online. Anyhow, the following steps demonstrate how to setup a different account and using it to allow Docker Desktop to access the drive. Whilst a bit hacky, this does seem to be the only work around for this issue. 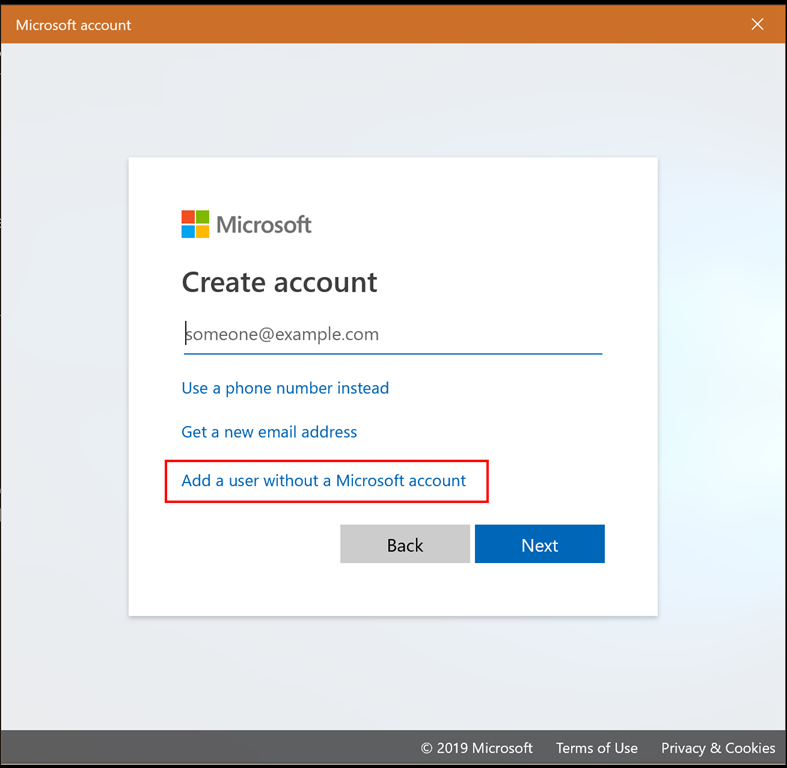 To setup a new account launch Settings, click Other users and then click the + button under Other users. 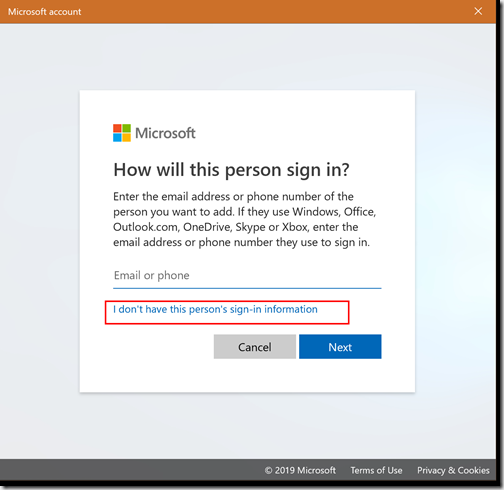 When prompted to enter email or phone number, instead click the “I don’t have this persons’ sign-in information” option. 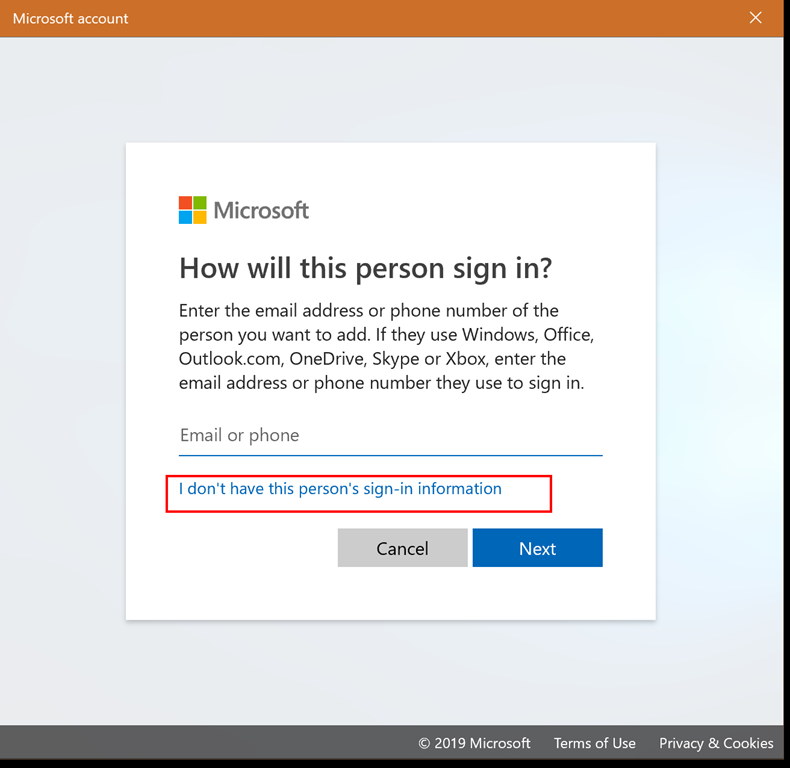 When prompted, enter username, password and some security questions. 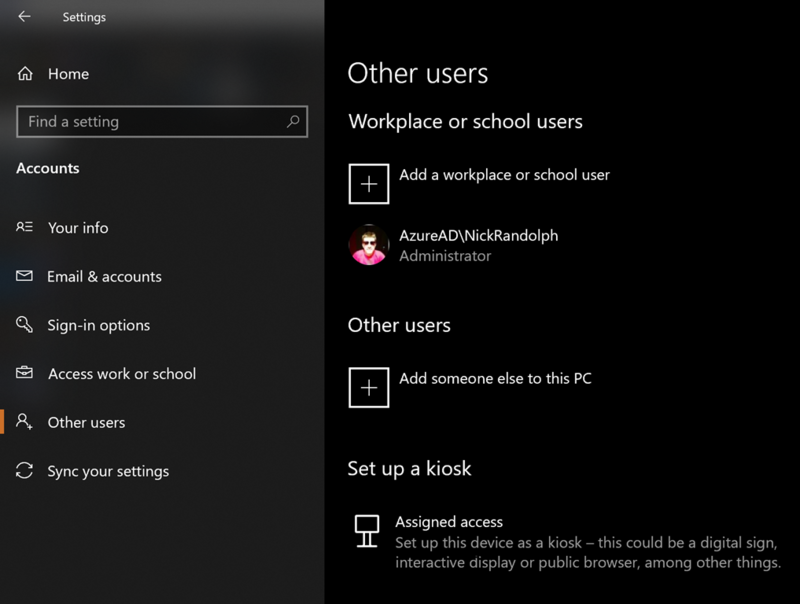 Next you need to change this user to be an administrator, so expand out the account under Other users and click Change account type. Return now to Docker Desktop and enter the new account as part of setting up the shared drive. You shouldn’t see any further issues within the Docker Desktop application. 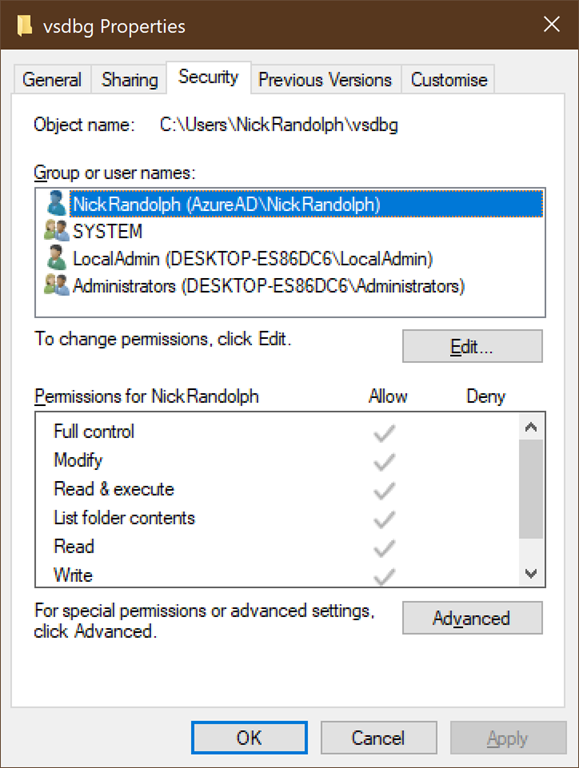 Attempting to run the application from within Visual Studio again reveals an error, this time complaining it doesn’t have authority to crLeate or adjust folders (including creating files). Locate the folder indicated in the error message, right-click on the folder and select Properties. From the Security tab, click Edit. 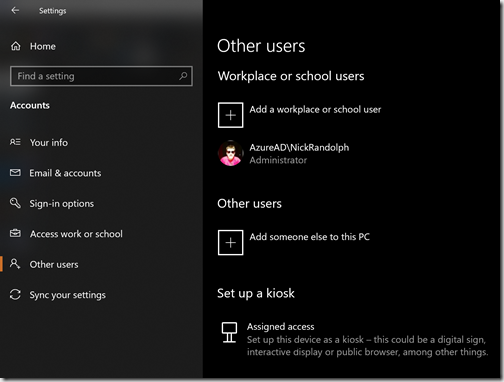 Add the local account you just created and make sure it’s assigned all permissions. You may need to repeat this process for 2 or 3 folders that Docker Desktop requires access to, and in some case assigning permissions can take a minute or two. 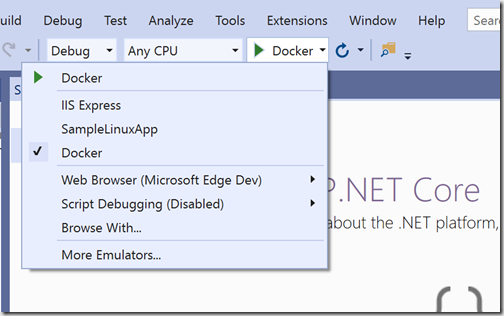 Once done, your application will be launched from within a Docker image, with the Visual Studio debugger attached.